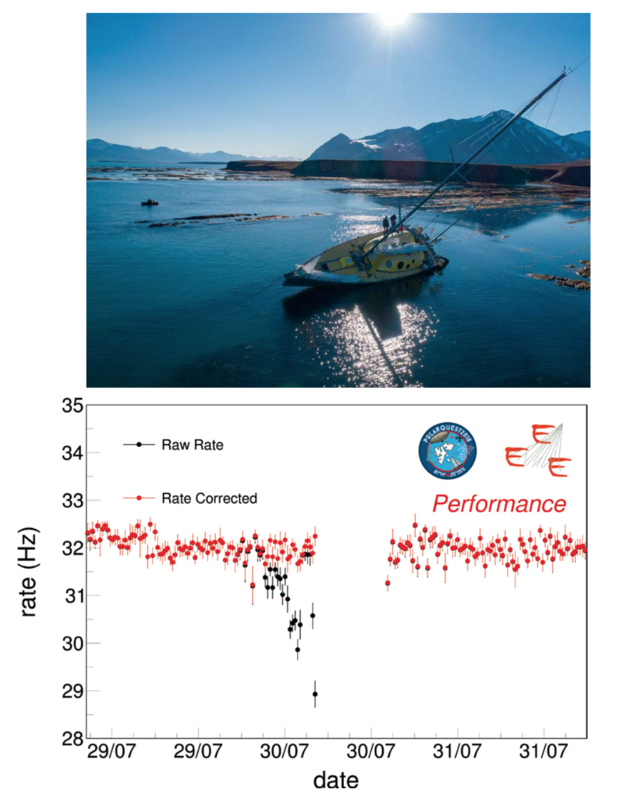 This article, by Polarquest scientists Rosario Nania and Ombretta Pinazza (on behalf of the EEE Collaboration), appeared in the Italian Physical Society’s Il Nuovo Saggiatore. Almost one hundred years have passed since the observation of the cosmic rays by Victor Hess and Domenico Pacini and several measurements have been performed to understand their origin, composition and energy distribution. Primary cosmic rays are mainly charged particles generated in extreme astrophysics events, like SuperNovae, and accelerated by shock wave mechanisms (the first-order Fermi processes). Traversing the space and its magnetic fields, their directions are modified, due to their charge; eventually they reach the atmosphere and interact with it, generating showers of secondary particles. The primary particles are mainly protons, with a small fraction of electrons and nuclei, but their exact composition is still a matter of intense study, being an important signature of the astrophysics events from which they originate. The secondary charged particles are mainly muons propagating in showers, and can be detected in various ways when they reach the ground. The study of cosmic rays brought important discoveries, such as the positron, the pion, the weakly decaying particles (Kaons) and the muons. Their contribution to climate and weather has been recognized. Since the ‘60s they have been used to realize “muon tomography” of pyramids and, more recently, of volcanoes. Nowadays, very large area detectors are operating, allowing measurements towards energies of 1020 eV (such as the Auger and Ice Cube experiments, in Argentina and Antarctica, respectively), and several experiments are being performed in space to investigate cosmic rays’ characteristics before they can interact with the atmosphere (e.g., PAMELA, Fermi, AMS-02 and DAMPE experiments). Cosmic rays are also a formidable tool to bring physics to young students and there are innumerable examples of small laboratory experiments that are performed in schools every day. 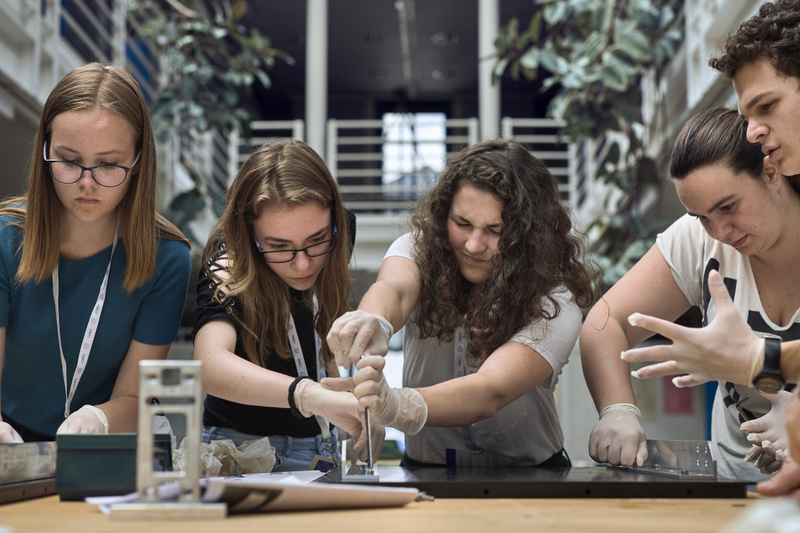 With simple measurements it is possible to stimulate students’ curiosity towards different aspects of physics, from particle detectors to electronics, data analysis and astronomy. 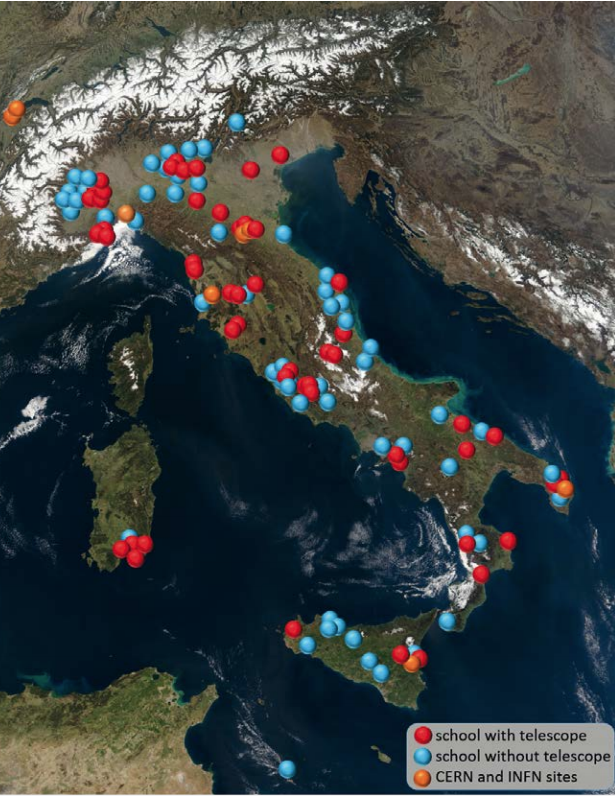 In this framework, a special role is played by the Extreme Energy Events project, started by Antonino Zichichi in 2004 and presently coordinated by the Museo Storico e Centro Ricerche e Studi Enrico Fermi in Rome (Centro Fermi). The EEE project has a double mission: perform a competing experiment for detailed studies on cosmic rays, and allow direct participation of students and professors from high schools. 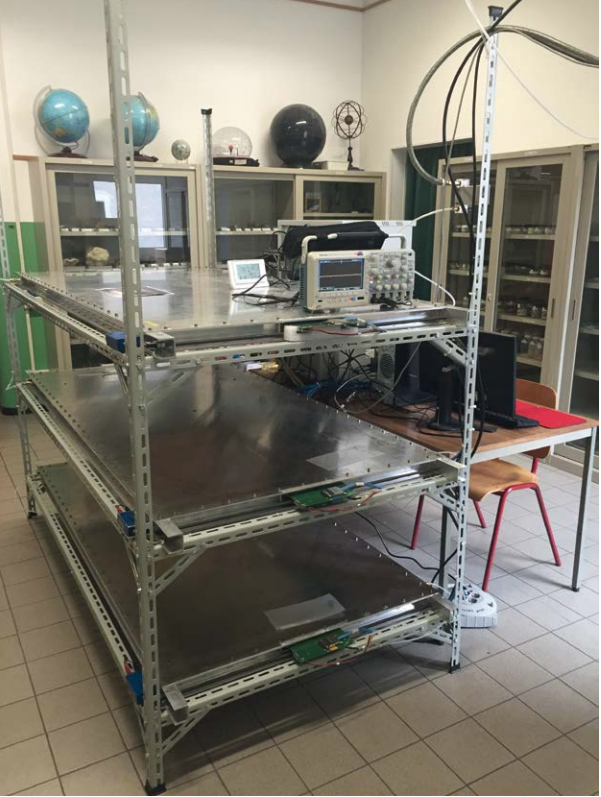 The first task is achieved by installing sophisticated particle detectors in the school institutes all over the Italian territory, thus realizing the experiment with the largest covered area (fig. 1): more than 50 installations over 500000 km2, with GPS synchronized data acquisition. Each installation consists of a “telescope” made of three MultiGap Resistive Plate Chambers (MRPC), about 1.3 m2 each, with time measurement at a precision of 200 psec, and tracking capability with 0.5 degrees precision. These detectors are derived from the more sophisticated ones used for the Time of Flight detector of the ALICE experiment at CERN. With more than 76 billion tracks recorded since 2014, the EEE detectors allow observation of high-energy showers and other special events, such as the Forbush decrease caused by the Sun activity or correlations at large (order of 100–1000 km) distances. Fig 1. Left: The map of high schools involved in the EEE project: different colours refer to telescopes installed in schools (red) in laboratories (orange) and schools without telescopes (blue). Right: one of the telescopes. 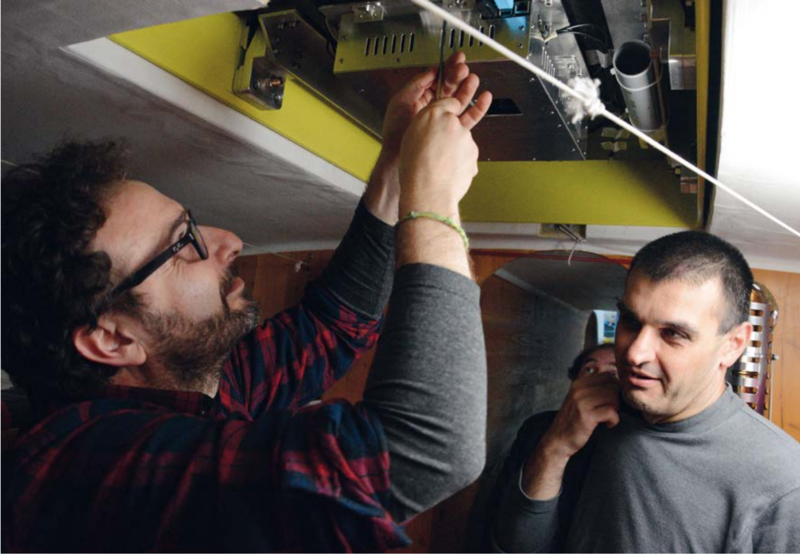 The second task is accomplished by involving the students in the detector construction at CERN, in their installation and maintenance in the home institutes and in the data analysis. Participation in Masterclasses and meetings (also via Web) allows a fully immersive experience in a real particle physics experiment. With the addition of 50 schools participating in the activities, although without a telescope, EEE has become a large collaboration, involving in total about 100 institutes and several hundred students every year. In spite of the large number of experiments performed everywhere in the world, there is still minimal data from the North Pole at sea level. In A. H. Compton review, back to 1933, only one measurement was reported in the Svalbard region. In 1999, the Polar Sea Ship Survey, with a neutron detector, confirmed an increase with latitude in the cosmic ray flux related to the corresponding geomagnetic decrease and a saturation from about 50° to 60°N due to the low-energy component being suppressed by solar effects: however their measurements stopped at 65°N. In 2007, a measurement was performed during a short test in a submarine beneath the arctic seas. Here, we will report of a new campaign of measurements carried out by the EEE collaboration with the Polarquest2018 mission, recording data up to the latitude of 82°07’N: the PolarquEEEst experiment. Fig. 2 The airship Italia (Bundesarchiv, Bild 102-05738/photographer: Georg Pahl/Licence CC-BY-SA 3.0). In 1928, the airship Italia (fig. 2), built and piloted by engineer general Umberto Nobile, reached the North Pole but unfortunately crashed on the ice pack during the return flight at about 81° N, north-east of the Svalbard Archipelago. The gondola was damaged and fell on the ice pack with part of the crew who survived and were finally rescued almost 50 days later. Six members flew away with the rest of the airship and were never found. The expedition was not a mere exploration mission or a publicity stunt for the fascist regime, but Nobile strongly shaped it as a scientific mission to study the arctic regions with different research programs on geography, oceanography, meteorology, bacteriology and physics. He also planned in detail a possible descent of scientists at the North Pole and compiled a detailed list of the required instruments and equipment. The scientific coordinator onboard was Aldo Pontremoli, an outstanding physicist of the Roma school, student of Orso Mario Corbino and colleague of Enrico Fermi. Pontremoli also designed special instruments to perform measurements of the three components of the Earth’s magnetic field, of the gravity acceleration and the marine currents. Pontremoli disappeared with the airship and almost all his measurements were lost. On board were also Finn Malmgren, a Swedish meteorologist and biologist who survived the crash but died while searching for help, and the Czechoslovak František Běhounek, expert in radioactivity and cosmic ray radiation, who survived and published the results of his measurements. All instruments for the scientific program had been carefully chosen or designed to meet the strong constraints imposed by the airship, such as restricted space, insensitivity to vibrations and a maximum total weight of 300 kg. Data was collected during the transfer trip from Italy to the Svalbard islands and during the three voyages in the arctic regions. Interestingly, the measurements could be performed also after the crash on the ice pack with the available instruments: Běhounek in particular was also able to recover an electroscope that was not damaged and collected data under the sea. From his measurements onboard the airship he could conclude that, over the ice pack, there is a penetrating radiation component that increases with height and has a similar intensity at different latitudes. In 2018, ninety years later, the Polarquest2018 project, coordinated by Paola Catapano (CERN Communications) sailed the northern seas around the Svalbard Archipelago, with the mission of remembering Nobile’s expedition and performing scientific measurements, as was done in 1928. The project was carried out using the Nanuq sailing-boat, a 60-feet Grand Integral designed, built and skippered by architect Peter Gallinelli to sail in the polar regions and withstand the arctic winter in an almost self-sustainable mode, thanks to an aluminum hull and a thermally insulated interior, performing like a passive igloo. On board, four programs have been carried out: search for micro/nano plastics in the sea water (CNR-ISMAR), search for PCB pollutants in the arctic atmosphere (Université de Savoie), mapping and cartography with drones (Università Europea di Roma and Società Geografica Italiana), and the cosmic ray experiment PolarquEEEst (Centro Fermi). 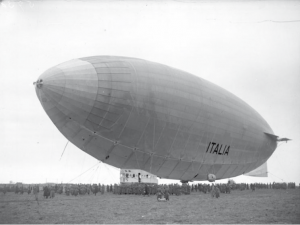 The mission was also an occasion to remember the airship Italia expedition, and a ceremony was organized in Ny-Ålesund, in Kings Bay, near the mast where the airship Italia was docked, at the presence of the descendents of Italia’s crew. Fig. 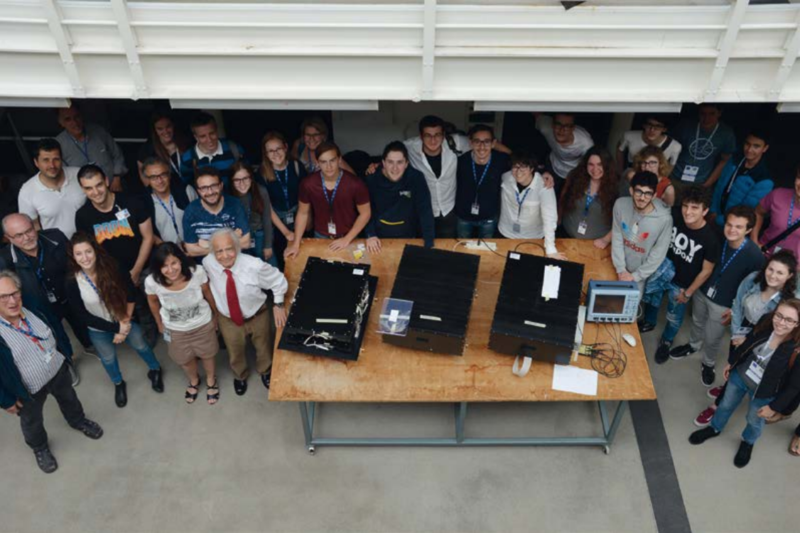 3 The construction of the three PolarquEEEst detectors with the help of the students and a group photo with Antonino Zichichi. PolarquEEEst, from an idea of Luisa Cifarelli, had two challenges: i) design and build a detector able to collect data during all the voyage, within the constraints imposed by the boat resources in terms of size, weight and power consumption, and ii) make it part of the EEE project, thus involving students from high schools both in the construction and in monitoring of the data taking. The detector was chosen as a double layer of 1 cm thick scintillators, where each plane is divided into four parts with an area of 20 × 30 cm2. Each scintillator element is readout by two Silicon PhotoMultipliers (SiPMs) placed at opposite corners. The structure is enclosed in a light-tight box and weighs about 60 kg. A special front-end electronics was developed with a Time-over-Threshold (ToT) discriminator and partial temperature correction. A redundant readout card based on both FPGA and High Performance TDC chip (HPTDC) was designed and built for the purpose. The readout board includes a Raspberry Pi 3+ mini computer with a double function: i) control of voltages and thresholds, monitor environmental (temperature, pressure, humidity) and dynamic parameters (GPS coordinates, pitch, roll and yaw of the boat) and ii) collect and integrate data from the 16 SiPMs in terms of time (about 5 ns resolution) and charge (via the ToT). After several tests, the trigger was programmed to require the coincidence of at least three SiPMs, in order to guarantee a coincidence between the two different planes. All data is referenced with the position and timestamp read by the GPS card. The electronic card was connected to the 24 V batteries of the boat, and a UPS battery was added to compensate possible voltage fluctuations and guarantee an autonomy of a few hours, if needed. In normal conditions the whole system had a power consumption of about 13 W. Data was saved on SSD and, whenever an internet connection was available, sent to the INFN-CNAF data center in Bologna for reconstruction and analysis, as is routinely done for all EEE detectors. In order to have reference measurements and allow long-range correlation studies, two additional twin detectors were built and installed in two schools at different latitudes. The three detectors have been assembled during a three day Masterclass at CERN by 21 students and 3 professors coming from different schools in Italy, Switzerland and Norway (fig. 3). Everything, from the scintillator wrapping, to SiPM positioning, mechanics, FE and cabling, was done by the students by use of special kits prepared for the purpose. Signals from the SiPM were verified by the students on oscilloscopes and a 6-plane coincidence was obtained by piling up the three detectors. Fig. 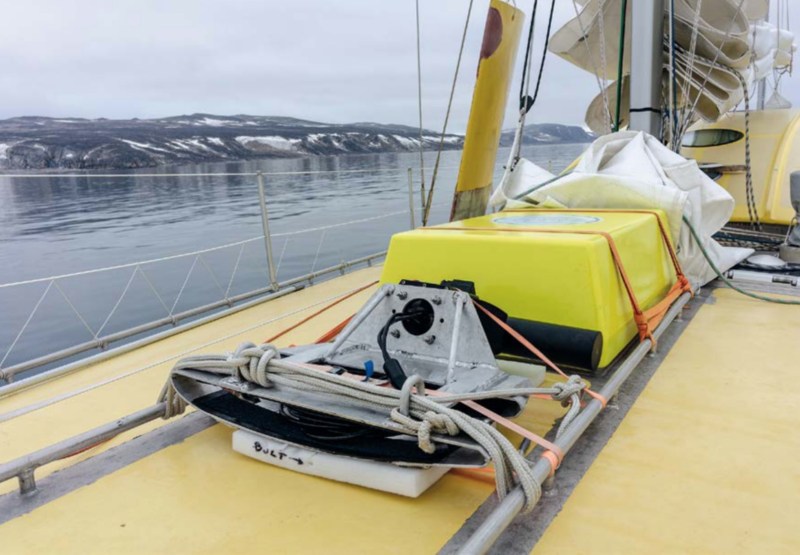 4 The POLA-01 detector: installed inside Nanuq (top) (photo courtesy of Anselmo Margotti) and its yellow cover box (bottom) (photo by Mike Struik, Polarquest2018). The three detectors were then equipped with the final readout electronics, and calibrated and tested for about one month. During this period it was possible to observe coincidences with two nearby EEE telescopes, detecting cosmic showers with all five detectors. Two of the three detectors (called POLA-02 and POLA-03) were transported to Nesodden (Norway) and Bra (Italy) respectively, installed and commissioned with the help of the students, and started to provide data immediately. During the full period of the mission, including summer holidays, students were required to monitor data every day and be available for maintenance of the apparatus (essentially a simple on/off/reset) if necessary. The third detector (called POLA-01) was shipped to Isafjordur (Iceland), commissioned again and installed on Nanuq inside a specially designed hatch, just above the sleeping berth (fig. 4). On the 22nd of July all three detectors were ready to take data, and Nanuq started its voyage. Onboard, the detector was monitored by an expert physicist with the help of two university students. Fig. 5 The voyage of Nanuq in longitude-latitude plane, displaying, in colour, the different preliminary rates measured by POLA-01, after pressure and vertical angle corrections. The Polarquest2018 mission started on the 22nd of July 2018 from Isafjordur (Iceland) and ended on the 4th of September in Tromsø (Norway), after sailing for about 3500 NM (see fig. 5 and Box 1 “Nanuq logbook”). 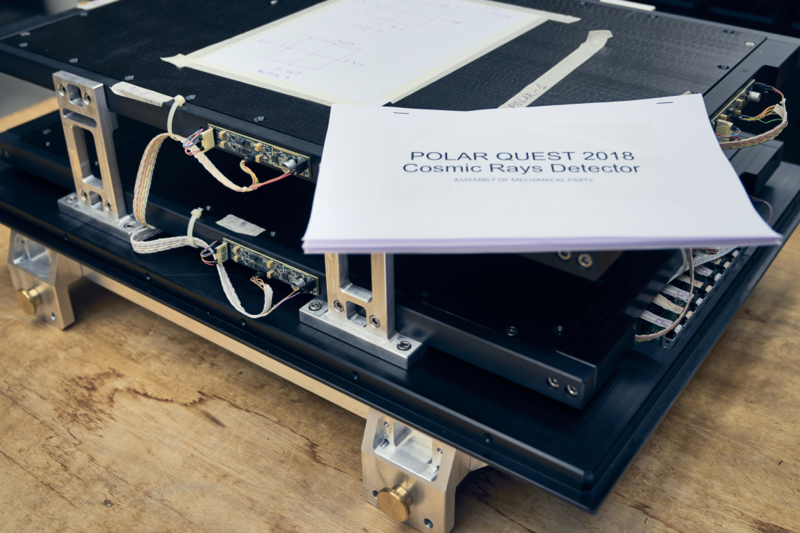 The POLA-01 cosmic ray detector has taken data almost continuously, integrating at the end about 861 hours of data with a global efficiency of about 91%, with small breaks due to various reasons (main power down, difficult weather conditions, detector reset, etc.). POLA-02 and POLA-03 were functioning during the whole period, with essentially 100% efficiency. In total, more than 110000000 tracks per detector were collected. Data from POLA-02 and POLA-03 could be verified and analyzed online by the students in Nesodden and Bra. This was not possible with POLA-01 because an Internet connection was not available onboard. Instead, all data was regularly reconstructed and stored on Nanuq, checked by the scientist on board, and a small set of trending information was sent daily using a satellite phone to allow a more precise verification by the experts. All the data is presently stored at INFN-CNAF computer centre and is available also for all students in the standard EEE data repository, via web access. The route of Nanuq tracked by POLA-01 is reported in fig. 5: the colour of each point represents the measured cosmic ray rate, corrected for the pressure and the boat inclination. An example of the capability to calibrate the detector is reported in fig. 6: on the 30th of July, Nanuq stranded in shallow waters and rolled on one side; at the same time POLA-01 measured the inclination of the vertical angle and a lower rate, and it was possible to correct the data using the accelerometer sensors. Fig. 6 The rate measured by POLA-01 while the Nanuq boat was stranded and inclined by 48 degrees. Top: a picture of the inclined boat (photo by Mike Struik, Polarquest2018). Bottom: the measured rate, before and after correction for the vertical angle. Fig. 7 Top: the preliminary rate of the three POLA detectors as a function of time, compared with the neutron cosmic ray data from the OULU experiment in Finland. Bottom: the preliminary double ratio POLA-01/ over reference/ versus latitudes with POLA-02 and OULU as references. In the upper panel of fig. 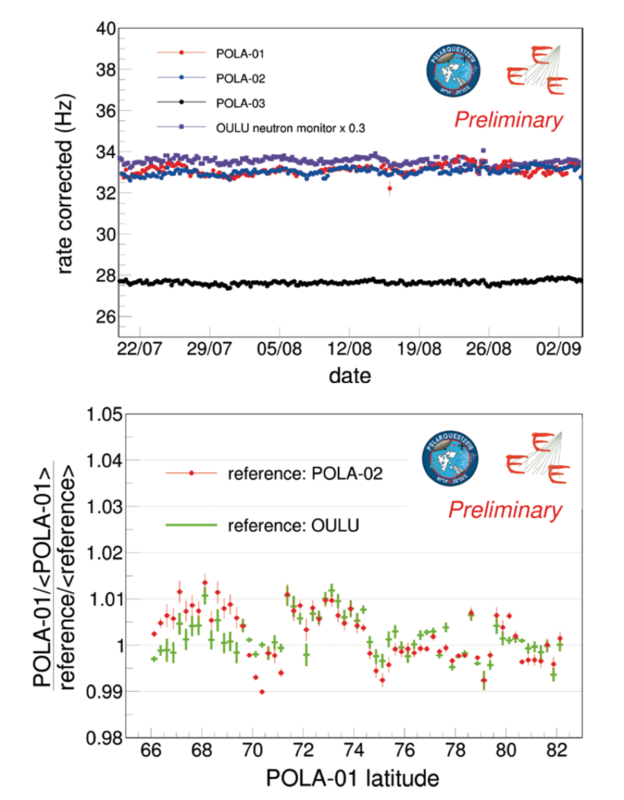 7 the measured rate of the three POLA detectors, corrected for pressure and inclination of the boat, is compared with the OULU neutron monitor rate in the same period, confirming similar fluctuations related to primary cosmic ray flux variation. Note that the POLA-03 shows a lower rate mostly explained by the presence of dense material on the roof above the detector. The lower panel of fig. 7 reports the variation with latitude of the POLA-01 rate compared with the one from POLA-02: with the present level of calibrations (1–2% level), no variation is observed in the latitude interval between 66° and 82° N, establishing for the first time the saturation of the cosmic ray flux at ground level also in these extreme regions near the North Pole. Further refinements of the analysis will be completed in the following months, including temperature corrections and possible influence of the nearby geographical elevations. Measurements are now being carried out at different latitudes along the Italian peninsula; future plans include the possibility to install the detectors in a permanent location at the Italian Arctic Base by CNR, in Ny-Ålesund. In conclusion, the PolarquEEEst experiment has successfully collected data on cosmic rays between 66° and 82° N latitudes, a region with, up to now, very few measurements. The detector performed excellently, despite the tight constraints imposed by its integration inside a sailing-boat. The choice of involving high school students in this experience received great enthusiasm and interest and proved, once more, the success of the idea to combine a physics experiment with a science dissemination program, as done for the first time by the EEE project of Centro Fermi. PolarquEEEst is a project of the EEE Collaboration, with contributions of CERN, INFN (Bologna and Bari sections), Universities (Bologna and Bari) and Politecnico di Torino. A special thanks to all the crew of the Polarquest2018 mission for all their help during the voyage (fig. 8). Thanks to Ludovico Machet and Alberto Rolandi who helped to control POLA-01 on board. Fig. 8 Crew of the Nanuq. A few days after the departure from Isafjordur, in the northwest of Iceland, daily rhythms are already baffled by continuous daylight and watcher shifts. The first leg of the journey foresees several days of open sea to cross the northern Atlantic and the Greenland Sea from Iceland to the Svalbard Archipelago. 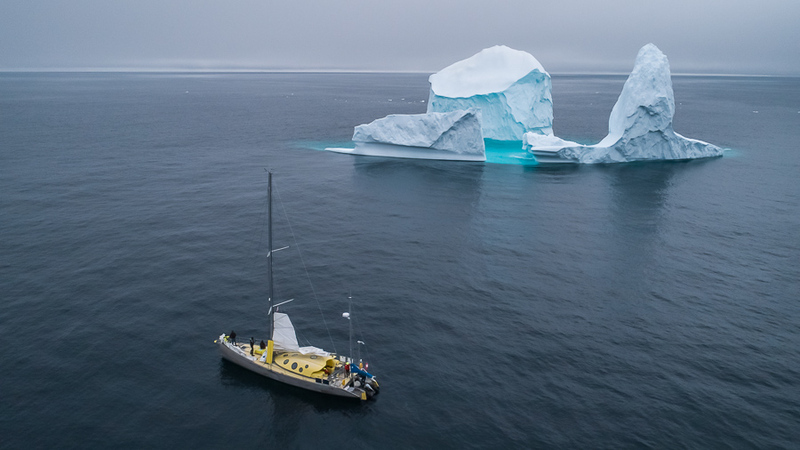 A western deviation allows sailing with more favourable wind, and a first outing at the beautiful, wild Greenland east coast, just south of Kap Brewster. This is the last ground we’ll step onto before the long, dreaded crossing. At 68°N, we spot the first icebergs: some have weird shapes and blueish colours, and are generated by glacier fronts; only a few at these latitudes are white, flat, and originate from the ice cap shredding. Winds and weather are benevolent, and allow a long, quiet, broad reach sailing, during which we all lose the concept of today’s date. The sea is rather smooth but stingy with surprises; only rare whales, dolphins and seals are spotted from a distance. Six days and 900 NM later, stunned after the long continuous sailing, the Svalbard coastline appears among the fog banks. Excited by the long-awaited moment, distracted by a large group of white beluga whales circling around the boat, a moment of hesitation with the brand new, sophisticated navigation system… and suddenly the boat gets stuck in shallow waters. After trying the typical manoeuvres to free the keel, soon we realize we have to surrender to the low tide. No panic, we didn’t suffer any damage, but nature is too strong to fight. I profit from the forced pause to observe the wilderness around; low tide means lunch time for dozens of arctic sterns plunging for fishes into the sea just nearby. On the shore, reindeer graze the low scarce vegetation, and in the background, a beautiful glacier dominates the landscape. Slowly, the boat inclination reaches a bank of 48° while everyone is waiting patiently, seated or lying down on surfaces which are usually flanks or side walls. Nine hours later the high tide starts visibly flooding the bay and soon the boat can roll back and regain freedom. From this moment on, we’ll be coasting from fjord to fjord, stopping at any time, day or night, to explore glaciers, ancient settlements, observe local flora and fauna and take photos. Behind every cape, in all fjords and bays, there are immense glaciers, some are retracted behind the shores but many are actively entering into the sea, spilling icebergs and ice crumbs into the surrounding waters. They are bordered by long moraines and turbulent meltwaters. There are no paths, the terrains are unstable, soft and moving. During our explorations, we have to cross icy streams and sink in sands and soft muddy soils, due to the temporary melting of the permafrost. The Svalbard archipelago has never been inhabited by a native population as it is in Greenland. Instead, small groups of whale hunters and miners, mainly from Russia and Scandinavia, have built wooden huts and facilities to spend short periods on the coast. Nowadays, the Svalbard territory is administered by Norway, and the only permanent settlement is Longyearbyen, together with three mining towns, partially habited, and two scientific stations. Longyearbyen is a lively village, with almost 1000 tourists per day during the summer. There are a few hotels and restaurants, and a supermarket where we refill the galley before the circumnavigation. The crew is now complete, and the journey on the tracks of the “Italia” airship can finally start. We start sailing north, towards King’s Bay and Ny-Ålesund. Today, Ny Ålesund is the site of the international scientific base in the Arctic, and the northernmost habited settlement. It looks like a colourful Scandinavian village, on the foothill of mount Zeppelin. Around the wooden houses it’s not difficult to spot reindeer and arctic foxes. To the east, the dramatic view of the bay spotted by icebergs on the backdrop of the magnificent Three Crown Peaks. Ninety years ago, King’s Bay was the logistic base of the Nobile scientific expedition and afterwards, of the rescue mission. Here we meet the descendent of the Italia crew members, 90 years after the Nobile expedition, and we celebrate the reunion with a ceremony near the monument to the victims of explorations. At the Italian CNR base “Dirigibile Italia” we are welcomed by a group of young researchers, physicists, biologists and botanists, full of enthusiasm and highly committed to their projects. With them, we have the opportunity to visit the facilities and their field work, where they observe the evolution of the permafrost and monitor the quality of the atmosphere. Our journey continues to the north: we visit a German weather base dating back to 1941 in Krossfjorden, unfortunately raided by frequent visitors; the magnificent Magdalenefjord, well-known destination for large cruise ships; Virgo Bay, which was a logistic base, where the Swedish explorer S.A. Andrée built a hangar for his aerostatic balloon in 1896, and later the American W. Wellman for his airship, in 1906. None of them could reach the North Pole, and the area with the remains of their buildings is now protected as an archeological site, and forbidden to tourists. Without landing, we explore the area with drones, taking stunning videos and aerial photos. We drop anchor at the entrance to Bockfjorden, a bay in the north of Spitsbergen where we intend to explore a group of hot springs on the foothill of an inactive volcano. Here, eight years ago, our CNR colleagues installed some sensors to study the evolution of the flora around the poles, but they have not been able to recuperate them and have asked us to verify if they are still active. After reaching the coast with the tender, we start a 5 hours long march on soft sands and freezing cold rivers. We do not meet any animals, we only see old traces in the mud and find reindeer antlers, very frequent everywhere at Svalbard, and a bear carcass. The Troll springs are small pools of warm water full of coloured moss, surrounded by mineral deposits with smooth shapes. Unfortunately, there is no trace of the sensors installed by our CNR colleagues, but we take lots of photos and videos of the area that we will send them after our return. Now we are at the north side of the archipelago: boats are becoming very rare, but we can finally observe a large family of walruses. Stony beaches are stippled by plastic objects, mainly fishing nets and colorful buoys, and numerous white tree logs, carried from the Siberian coasts by the sea currents. Island and capes are marked by cairns and signal points, testimony of ancient explorations. In Nortkapp unfortunately, we lose one of the drones: it seems that the mismatch between the magnetic and geographic north pole, which govern the compass and the GPS of the device, causes a malfunction in the navigation system, until we lose control of the device. Despite a long search, the drone is not found. Here in the north, and in the north-east, the names on the maps recall the events and the protagonists of the story of the airship Italia: Finn Malmgrenfjorden, Albertinibukta, Behounekodden, Sora-Viglieriberget, Kapp Laura, Italiaodden, Dolomittøyane. We spend one day on a small island called Alpiniøya, to perform an aero-photogrammetric survey of the island with the remaining drones. Alpiniøya was discovered in 1928 by Alpini captain G. Sora together with the arctic guide S. van Dongen during their rescue operation, after having covered more than 1000 km on their skis. We head north again across the open sea, enduring a long, annoying swell. At 82°07’ N 25°25’ E, much further north than expected, we reach the outer boundary of the ice shelves. Here the ice pack is not a solid and continuous line, but a dense slurry of ice. I’m surprised to find hundreds of birds resting on the ice or floating around. We profit to collect the northernmost sample for the microplastics analysis: the filter is full of plankton, but there is a blue piece of plastics as well. This is the northernmost point of our voyage. From here, we bend south-east, towards the coordinates of the crash of the Italia airship, estimated by the group of survivors. Hitting the surface, which in May 1928 was covered with thick ice, part of the gondola broke and fell on the ice pack, together with ten crew members; the rest of the crew disappeared with the balloon, and most probably fell 10-20 km away. This area has not been accessible until recent years, due to the permanent presence of ice. In the crash point we celebrate a ceremony to commemorate those lost, and leave a wreath of flowers and a cross entrusted to us by the families of the descendants, to the sea. We head then to the extrapolated possible crash area of the balloon. The seabed is deep, but as soon as it reduces to less than 600 m, we can start the scan of the bottom. The instrument we have onboard is a highly sophisticated multibeamer, the data are recorded and will be processed offline by the experts of the company. We are now proceeding south, along the east coast. The north-east sides of Svalbard are very different from the west: here the Gulf Stream is not able to penetrate. We sail along immense glaciers, tens of miles wide; the water is calm and full of icicles. After several weeks, we finally see a polar bear in the distance. Our voyage around Svalbard was characterized by very weak winds, but suddenly a strong perturbation is approaching from Siberia; the wind is stronger than expected, blowing at more than thirty knots with gusts exceeding fifty. We stop for precaution in a bay for several hours. Here, an unexpected encounter with two Swedish adventurers who are completing the circumnavigation, following just the same route, on a small rowing boat. After completing their mission, we will spend a few days together exchanging stories and adventures, ideas and projects. On the south, we visit a French weather station, and another inhabited scientific base, the Polish base of Hornsund, where we are greeted with warmth and interest. The Hornsund fjord is the most generous of encounters. Among spectacular mountains we have the pleasure of meeting three bears, a mother and two cubs, on an iceberg, where they have already completed a meal. A little further away, the spray and the surface evolution of a humpback whale. Not far away, a short walk through the muddy beach of Kapp Borthen and we get to the wreckage of a German warplane. World War II hit Svalbard after 1941, when this territory became a strategic site for weather stations used by Germans in view of their expansion towards the Soviet Union. The circumnavigation is now completed. Before our return to the port of Longyearbyen we have one last stop in the Russian mining town of Pyramiden. There are old buildings from the Soviet era, debris, polluted areas. It is considered a ghost town, many birds and foxes have taken possession of the abandoned houses, but signs of rebirth are evident, thanks to a growing tourism. We enjoy climbing up the mine tunnel and visiting the remains of a huge coal mine. Polarquest2018 mission has ended in Longyearbyen. The detector, however, remains on board and will still take data for about ten days, until the arrival of Nanuq in the Norwegian port of Trømso. During the voyage we have successfully performed several different scientific activities: the POLA-01 detector has recorded 860 hours of data; several samplings have been collected to search for microplastic pollution; remote glaciers, islands and seabeds have been mapped. 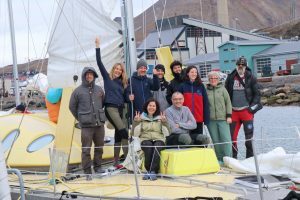 Polarquest2018 was a social experience, bringing together ten very different people, to share the tasks and the reduced spaces of a boat, each one carrying their own scientific, technological and human mission. It’s an unforgettable adventure, an exploration of challenging new territories, enjoying the wilderness, the vast desolate landscapes. We have observed rare wild animals which have been able to adapt and survive in an extreme environment, and we have witnessed the effects of an exceptionally warm summer and the impact of human activities in this fragile habitat. High school students assemble the PolarquEEEst detector!